Women participate in Recruiting for Good referral reward service to help fund Our Moms Work, community service; earn fun trip to experience Salon Du Chocolat. SANTA MONICA, CA, UNITED STATES, October 1, 2018 /EINPresswire.com/ — Recruiting for Good rewards women who participate and make referrals to help the staffing agency fund Our Moms Work; 'Women Love French Trips' to have fun learning French while traveling in a specially curated small group trip. Women Love French trips are small intimate specially curated travel groups for six women and one group leader. Group leaders are kind, passionate, and native French speakers, who know Paris well. 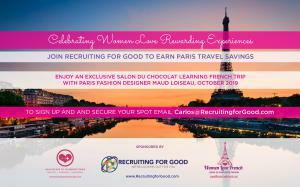 First Women Love French Trip is in October 2019, learn French while experiencing Salon Du Chocolat and enjoy shopping with Mademoiselle Maud Loisueau, a French Fashion designer. 1. 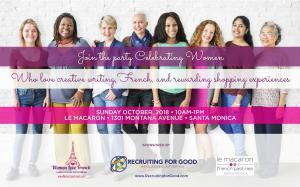 Attend Party Celebrating Women at Le Macaron in Santa Monica, on October 7th, 2018, between 1130am to 1pm. 2. Once we meet woman in person at party, we only invite a woman who shares similar values to meet privately for lunch in Santa Monica, and discuss how our collaborative funding service works. 3. Woman will be invited to participate in collaborative funding provided by Recruiting for Good. 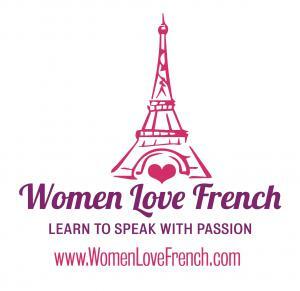 Women Love French is an invite only service helping fund gift B-Day Trips for women who love to learn French while traveling in Paris www.WomenLoveFrench.com. Women can enjoy our specially curated small group Paris Trip to Salon Du Chocolat with Maud Loiseau; this is the perfect trip for women who love chocolates, fashion, fun parties, shopping, and learning French October 2019.